What is a foam rolling? Foam rolling is essentially a self myofascial release. Which is an elaborate term for self massage, working on the fascia of the body. Fascia is a connective tissue that encapsulates muscles and muscle groups, think of it like cling wrap! Unlike muscle tissue, fascia can’t be stretched, so when it’s tight and restricted, it needs to be released through myofascial work. This can be done through a range of ways, foam rolling is one of them. So if you have limited range of motion and stretching isn’t lengthening your range, it may be the fascia that is restricting you. Foam rolling also work on the trigger points within the muscles, these are the focal points of taught bands that can often cause pain and restricted range of movement. The idea of foam rolling is to place the desired body part on the roller and to slowly glide your body down the roller, applying pressure to the area. 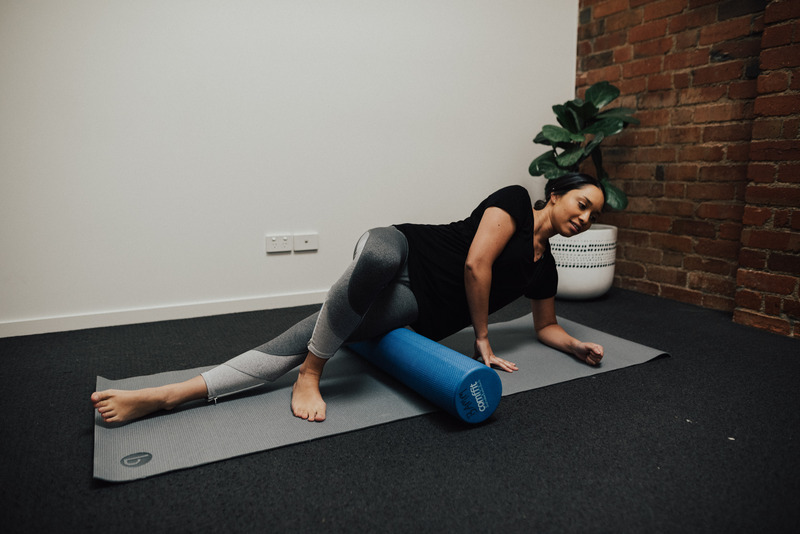 The compression of the targeted area means that as it is released from the roller, the normal blood flow returns to the area and helps to restore the tissue. Never roll on a joint or on bone, only ever roll through the soft tissue of the body and avoid rolling the lower back. As you begin rolling, if you find a section of the area / muscle is particularly tender, hold that area for a moment and relax. You should slowly feel the tissue start to release and the pain should lessen. If you find that where you’re rolling is too tender, move the roller slightly forward or backwards to loosen the entire area. You can also back off a bit with your body weight. You don’t need to be pressing your whole weight into it for it to be effective. Rolling should always be controlled and gradual, don’t expect to loosen years of tension with one roll! The pain is caused by the compression of the trigger points, fascia and muscle tissue. It is often referred to as a ‘good pain’ and the more that you do it, the less severe the pain will be as you’re loosening off these areas. If when you’re rolling, you’re in a position that’s causing pain anywhere else in your body stop immediately. If you can, reposition yourself and resume, but if the pain continues, make sure you don’t push through. If you have any questions about foam rolling please give us a call and we also sell high quality foam rollers.